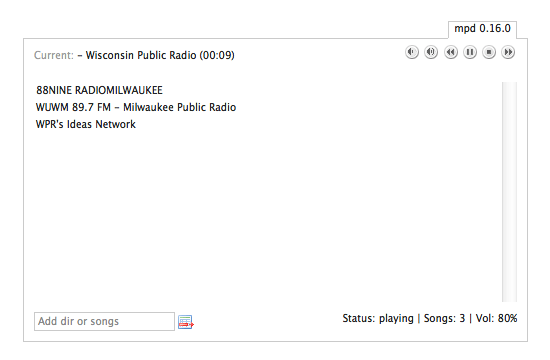 If you read about my Radio Milwaukee Radio and thought having just one station to listen to was rather silly, we can do something about that. One station means no choices (and no controls) but with multiple stations we need a way to select which one you want to hear, and there are clients that can make that possible. Since the Raspberry Pi is on our home network via WiFi, that means any other device on the network can control it. And since these are PHP web apps, you’ve got the source, and can edit the CSS as you see fit, so customizing the look should be pretty simple. Want more options? There’s a giant list of MPD clients on the Music Player Daemon Community Wiki. This creates a playlist with 3 items, and will start playing the first item in the list, so put whatever you want as the default first. 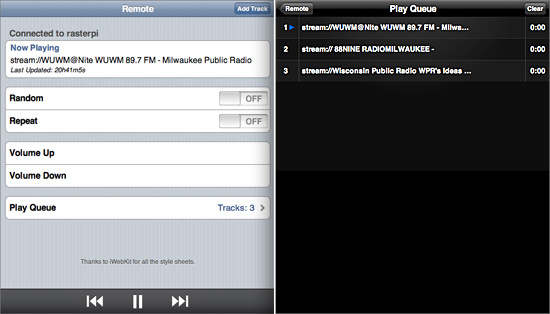 This list will play the 88.9 Radio Milwaukee stream until you select another one. You can even add new streams (temporarily) using the MPD-Webinterface. At the bottom of the interface is a text field, just paste in a stream URL and hit return to add it to the list. (I pasted in http://wmse.msoe.edu:9000 for WMSE 91.7) I said ‘temporarily’ because only the three that are hard-coded in our bash script above will survive a reboot/restart. Oh, keep in mind you need the actual stream URL, not the playlist URL, which is one that usually ends with a .pls file extension. Normally you’ll need to view the source of a .pls file to see the stream(s) listed within it. That’s it for now kids… have fun with your Raspberry Pi Radio! Posted on Wednesday, February 20th, 2013 at 10:35 pm. Subscribe to the comments feed. Both comments and pings are currently closed. Post on your own blog.